Baileygate took a foul turn Sunday from bad political optics to something much more ominous. And the Florida Cabinet and Legislature need to respond accordingly. Longtime cop and FDLE Commissioner Gerald Bailey was fired by Gov. Rick Scott staffers last month. Initially it was reported that during his reelection campaign, Scott political campaign staffers had run-ins with Bailey who rebuffed their efforts to politicize his agency during Scott’s campaign. Bailey refused to participate in campaign activities and complained about being improperly hit up for campaign contributions. So, literally days after his reelection, Scott’s minions forced Bailey out. Initially Scott claimed Bailey resigned, but after Bailey clarified he was fired, Scott’s spokesperson corrected the governor. That’s not just bad optics. It’s a federal crime to conspire to falsely deprive someone of their liberty under color of law (Title 18 USC 241). It’s also a state crime to make false statements in criminal investigations, misuse an official position and act falsely under color of authority (F.S. Chapters 837, 838, 843). If the allegations are true, state and federal law enforcement will be reviewing the sorry affair. The Florida Cabinet and legislature are obliged to conduct their own reviews as well. The Florida Cabinet, who by law must take part in the firing and hiring of the FDLE commissioner, all say they were duped and had utterly no idea Bailey had been unilaterally fired. That’s not enough. They all voted to accept Bailey’s resignation. If they were truly misled, they need to demand an opportunity to ask tough questions of the governor and his staff at the next Cabinet meeting. It would also be fitting for them to demand an independent investigation outside of FDLE by someone untainted by political influence. And the Legislature needs to be acting like it’s concerned. 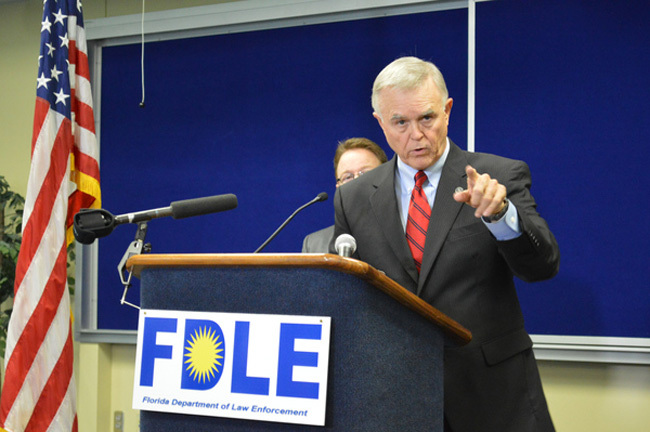 Both the House and Senate have criminal justice and judiciary committees with oversight of FDLE. The failure of legislative leadership to vigorously address these allegations will reek of political favoritism. If the governor were a Democrat, he and his staff would have been dragged in to answer questions within hours of the report. The firing of a police commissioner because he would not allow his agency to be politicized sends the worst possible message to FDLE and the entire law enforcement community. By all accounts, including Scott’s, Bailey was a “great” commissioner. In this instance he did precisely what he was supposed to do and the law demands. Firing of a police commissioner because he would not allow his agency to be politicized sends the worst message to law enforcement everywhere. Scott should have called Bailey and thanked him for demonstrating the kind of integrity you hope your top cop possesses. But instead Commissioner Bailey got sacked. Think about what will happen when one of Scott’s staffers asks the next FDLE commissioner or agent to do something inappropriate or illegal? Will they follow the law or will they not have enough guts to do the right thing at the expense of their job? For Bailey’s replacement, the taint is too much as the public will understandably believe he got the job because he was loyal to the governor and his staff – rather than for his independence and fidelity to the law. Most troubling is that FDLE has a critical “watchdog” jurisdiction over government and investigates misconduct by state officials. It will be hard for the public not to believe that FDLE’s decision-making is influenced by the political interests of the governor’s office. It’s not fair to prejudge the conduct of Scott and his staff before proper investigations. That’s the jobs of law enforcement, the Cabinet and the Legislature. And they owe it to Floridians to do their jobs. Dan Gelber, a former federal prosecutor, was a Florida Democratic state senator. Was Gerald Bailey’s ouster legal? The January 16, 2015 edition of Florida This week suggests that the ouster of an agency head that reports to both the the governor and and the cabinet requires the approval of at least one cabinet member. If the requirement was met, which cabinet member approved his dismissal? I guess given the overt politicization of fire/law enforcement locally, this does not even merit comment here in Flagler County. …. and we reelected this known cheat. Shame on us! We’ll reap what we have sown. “We” didn’t reelect this snake. Idiot GOP voters did. I’m taking no responsibility for this fiasco. I voted for Crist. Idiot? Far too limited. Leaves out selfish, insane, criminal, etc., etc. I never voted for this Snake, saw the writings on the wall when he got away with the medicare fraud, and him taking the 5th, and slithering away to run and get elected twice. What is wrong with soime , many idiot voters, are they so blind, and like this Grand Ole Party. Now Bondi and Ashton, and Willie Megs, & Putnam all stand with the crookery. They all should be in jail, and investigations from other counties attorney general investigators should pull out all stops, records, meetings, and stop this Florida crime group. Scott is in many pockets, or should I say many are in his. Mr. Bobbly head, swallowed the canary this time, and so did his supportors. LIARS finally get caught, perhaps the others will swallow the snake’s eggs. After watching the video it appears Gerald Bailey was most certainly forced out by our “snake in the grass” governor. . . unfortunately, it’s politics as usual in the corrupt government of this administration! Once a sleazy head of Columbia now a sleazy Governor. What a mistake Floridians have made. Once is a mistake, twice is criminal negligence. I’m with Nancy. . . no way did I vote for this dishonest, heartless man . . . or his cronies in the legislature! Scott needs to be investigated regarding this. However, to say things would have been different under Crist?? That is laughable. Crist has his own agenda and cronies, particularly, John Morgan. So…let us disperse with name calling, shall we? Crist’s issues were that he wasn’t trustable because of his: “I’m a republican, I’m an Independent…no wait…I’m a democrat!” antics. Crist has a heart? Crist is honest? Yeah…not buying it. Scott has his issues as well, but his cutting the government during the recession was responsible. His taking on the entitled teacher’s unions was responsible. Especially, when he knew he was making an enemy for life. That earned him a second term, IMHO. Let’s not pretend that favors and jobs aren’t given based on election results. That constantly happens in every election, no matter how small. That’s just part of it. However, is It done legally??? That’s what matters, the rule of law. Naaahhh .The Florida Ethic Commission won’t find any fault when if called…Also why all here and there are defining these crimes “politics”? They are crimes and getting away with it over and over political connections!